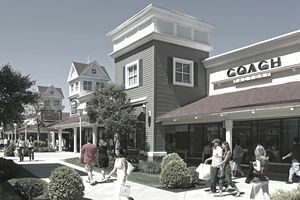 Located 100 miles from New York and Boston, Clinton Crossing Premium Outlets in Connecticut is an upscale outlet mall with over 70 name-brand and designer outlet stores. From Hartford and Springfield: Take Interstate 91 south to Exit 22S (Route 9 South) to Exit 9 (Route 81 South). Turn right onto 81 South and go 14 miles. Clinton Crossing Premium Outlets is on the right. From Mystic, Rhode Island, and Boston: Take Interstate 95 south to Exit 63. There are several sales and mall-wide events that go on throughout the year, including holiday weekends like July 4, Columbus Day and Black Friday. The outlet stores set up special in-store sales and sidewalk sales and the outlet center's hours are often extended. The Clinton Crossing Premium Outlets Sales & Events webpage lists events quarterly. Looking for coupons? The "Deals" webpage on the Clinton Crossing website lists all the current store promotions and coupons that are available. For shoppers looking for extra savings, the VIP Club offers special perks and an exclusive "members only" printable coupon web page. It is not unusual to find several outlet stores with coupons for 20, 30 and 40 percent off. Members who are traveling can access their account and change the "Favorite Location" to their destination and receive the coupons for the mall they will be visiting. Another good source for finding deals is through social media. The outlet center is active on Facebook and Twitter, and shoppers can receive promotional information about all Simon Premium Outlet Centers on Instagram and Pinterest. Shoppers who are in the military and veterans can show their military IDs at the Information Center and receive a free VIP Coupon Book for themselves and their family members. Groups of 10 or more receive a free VIP Coupon Book by filling out the Group Tour Reservation form in advance. For more information including store updates and the outlet map, visit the Clinton Crossing Premium Outlets webpage.